Simple and affordable, easy to use, 3 piece anti-aging and pigment skincare system that uses a proprietary foam technology to deliver highly concentrated levels of ingredients in elegant formulas designed to be safe and effective. 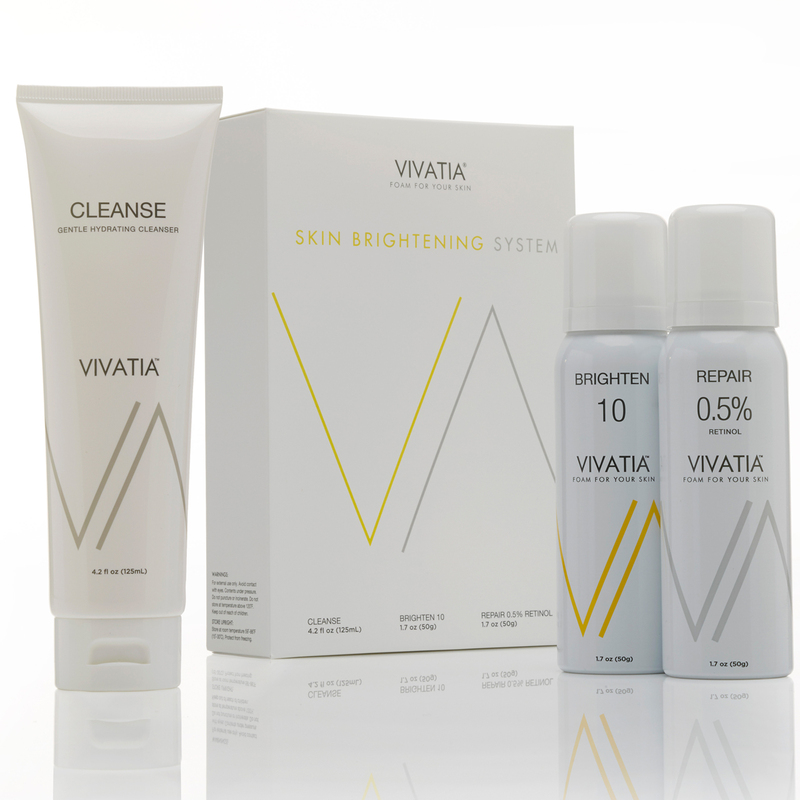 Gentle yet powerful mix of 10 skin brightening ingredients to fade the appearance of dark spots and brighten skin. Apply a dime-sized amount of product in the morning and evening. If you experience irritation, use this product every other day for 1-2 weeks. Then, increase frequency to every day. Do not use if pregnant or nursing. Gentle yet powerful retinol treatment with antioxidants, vitamins and peptides to promote more radiant, younger-looking skin. Apply a dime-sized amount of product in the evening. If you are not currently using a retinol, begin by using this product every other night for one weeks. Then, increase frequency to every night. Do not use if pregnant or nursing. Gentle cleanser that hydrates while it cleanses away dirt and impurities. Rinse face with water. Gently massage cleanser on wet skin. Rinse again and pat dry. Water( Aqua), Glycerin, Sodium C14-16 Olefin Sulfonate, Acrylates/Aminoacrylates/C10-30 Alkyl PEG-20, Itaconate Copolymer, Cocamidopropyl Betaine, DI-PPG-2 Myreth-10 Adipate, Cocamidopropylamine Oxide, Glycol Distearate, Citric Acid, Potassium Sorate, Sodium Benzoate, Disodium EDTA, Aloe Barbadensis Leaf Juice, Panthenol, Chamomilla Recutita Flower Extract, Camellia Sinensis Leaf Extract. For external use only. Avoid contact with eyes and mucous membranes. Keep out of reach of children.